This is going to be full of Guardians of the Galaxy Vol. 2 spoilers so if you have not seen the movie, just stop reading now. We learned a long time ago that Sylvester Stallone had a role in Guardians of the Galaxy Vol 2, and it was only recently that we learned he was playing tough as nails Ravager, Stakar Ogord, aka Starhawk. Early in the movie, Yondu runs into Stakar at a popular Ravager hang-out. The two argue over their past dealings and it seems they both know each other from before. That's because they do have a long past. Yondu and Starhawk were members of Marvel's original Guardians of the Galaxy. 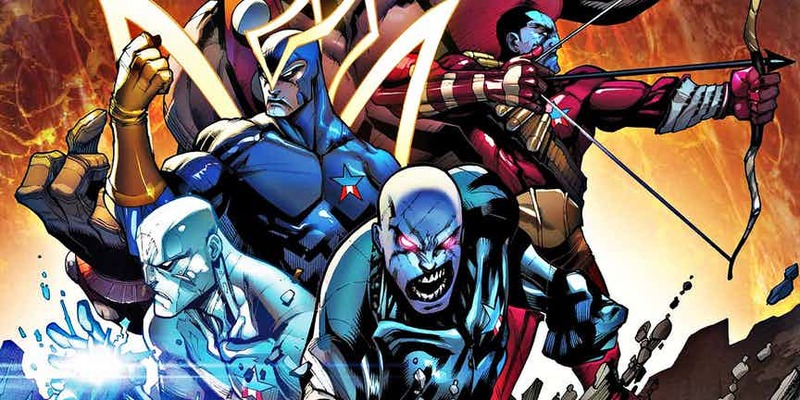 The original members (seen above) were Charlie 27, Yondu, Starhawk, Martinex and Major Victory. Throughout the movie and the 5 credit scenes, we get to see most of them on screen. But will we ever see them again? Will they get their own movie? "They're definitely the original Guardians. That was the fun of it and when James had the idea to do more with the Yondu character -- who is also an original Guardian -- there was the notion that he had a team once like Peter does now. That'd be fun to see them. Will we see them in the future, time will tell." "With all the post-credits scenes on this movie, they're all funny and fun, and most of them are things we hope to see continue on in the MCU. Whether that's a supporting role in future movies or whatever, I think it would be great to see those things and those characters show up." "Stakar (Starhawk) is played by Sylvester Stallone. Aleta Ogord is played by Michelle Yeoh and she's the female Starhawk and sister of Stakar Ogord who is her adopted brother. I know what you're thinking...Comics! Charlie-27 is the muscle of the group played by Ving Rhames. Yondu Udonta is played by Michael Rooker. Martinex is likely played by Michael Rosenbaum. Krugarr is a CG character. And Mainframe is...voiced by Miley Cyrus." I recommend you read CNET's entire interview, it's loaded with spoilery info! Personally, I would LOVE to get a Guardians of the Galaxy 1.0 movie. After my first viewing, I wanted more Ravagers. I would watch the crap out of a Ravager action adventure movie full of Stallone one-liners. What do you guys think, would a Guardians spin-off take away from the Guardians movies, or would it add to the already flourishing Marvel Cinematic universe? Sylvester Stallone's Role in GUARDIANS OF THE GALAXY VOL. 2 Revealed? Sylvester Stallone's GUARDIANS OF THE GALAXY VOL. 2 Confirmed and We Have Details!